Come here to command your character. For the person, like me, who have modify her character, you have 2 choices. 1 : You modify your character with all her face. So, for the perso who have choice the character from The Island Grow With You, you have to give me, by PM, all her face, so the 2 normal, Happy, Angry, Sad, Confused and Lovey-Dovey. 2 : For the person more lazy, you can just explain me how you want your personnage and I will create it. Since my char only has one face available, which is the normal face, the blinking face is just that with the eyes closed. Happy is like this: http://freespaces.com/inazumawolf/happy.jpg, angry is like this: http://freespaces.com/inazumawolf/angry.jpg, sad is just my character with tears forming by her eyes, and her mouth is hidden by her hands, which are up against her face and form fists. Confused is like this: http://freespaces.com/inazumawolf/confused.jpg, and Lovey-dovey is like this: http://freespaces.com/inazumawolf/blushing.jpg. Thanks a lot Dougy! Aha ! Its very funny, Chrona, but no. Erin, just a question : I do the character with one of the personnage who are already created, so what character of Harvest Moon you want me use to create your character ? I have some problem with my computer. I try to change the graphics board. And now, my computer can't work. So, I try to reformatted my computer but the CD are burnt, and my computer don't work. So, wait, I will reformatted my computer later. 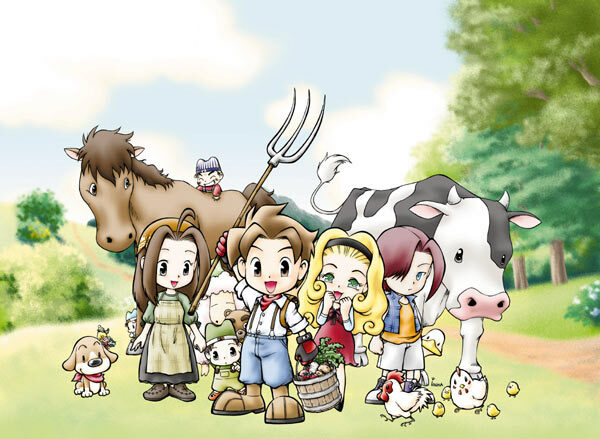 Harvest Moon RPG :: Before log in... :: Here !